Oh wow, this is groovy. I now take back all the non-programmistan propaganda I spread about Pipes! 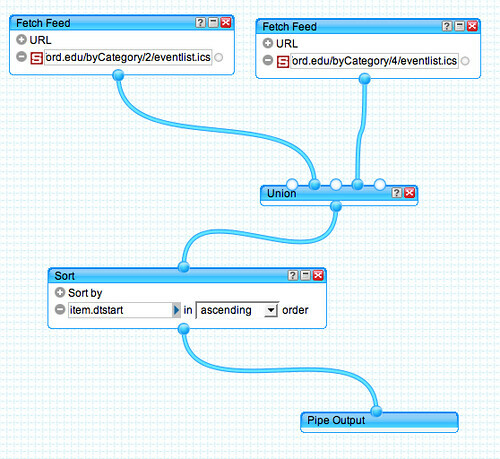 This is straight forward, and will serve as a nice hacked solution for aggregating ical feeds for UMW. You really are remarkable, the way you work through these solutions openly and meticulously helps me realize how much of what we do is that very process you narrate beautifully here. After this unbelievably helpful series of posts, you mmay have gotten yourself into an awkward position—because after this kind of response I may be trying it far more often :) Thanks Tony! Frickin’ brilliant. I’m curious about one thing. 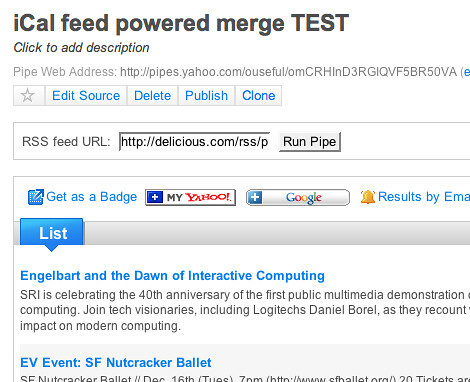 I get how you aggregated the feeds using Delicious and Pipes. Those steps are relatively straightforward for someone who understands how those services work. 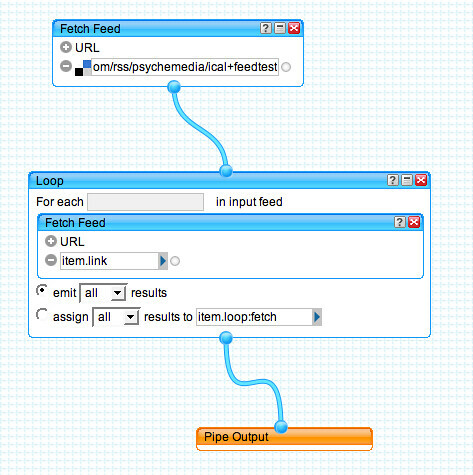 What I can’t figure out is what made you think to filter your Pipes feed URL through TinyURL? Maybe I don’t understand what tinyurl does, but that step would never have occurred to me in a million years. 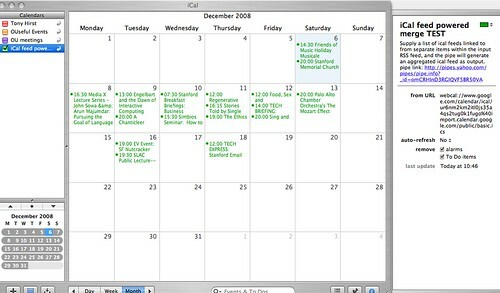 BTW, I used this to aggregate 10 separate calendars over at http://www.ppmrn.net. There are a couple of problems that can arise relating to the handling of unescaped URIs passed as arguments to a webservice, particularly when it’s ambiguous as to which URI an argument applies to. bad things can happen if the argument URL is not escaped and the example.com service has not been programmed defensively/to accommodate . For example, is “arg1” or “arg2” an example.com or example2.com argument in the following cases? Note that escaping gets problematic when you have a long pipeline if things aren’t escaped. For example, how do you read this? Who “owns” arg2, url2 or finalArg? 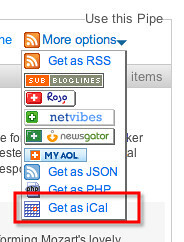 example.com/service, example2.com/service or example3.com/service? In some webservices, it may be that there is a limit to the length of a URI that is being passed to the service, in which case reducing the length of the URL you are passing is sometimes worth a try. Hey, nice blog here. I’ve been looking at getting this to work for some time, and the tip about tinyURL is a good one. I think I tried FeedBurner or some-such. Anywho. The hangup with getting this deal to work still boils down to how Yahoo Pipes fails to handle recurrent ical events out of gCal. See this discussion (http://tinyurl.com/bw8p39), and let us all know if you can solve it. 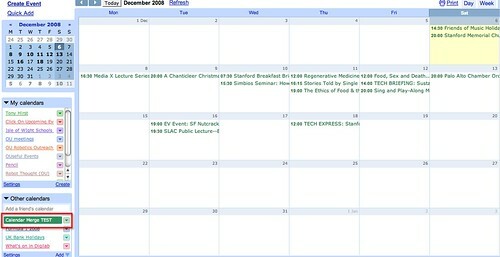 The differences is the missing Content-Disposition: attachment; filename=sotm09_test_2.ical which confuses iCal. Just an FYI for folks who read all the way down: I just wandered across this, and Yahoo Pipes now works with iCal on Lion. It might work with Snow Leopard, I’m not sure.. So how often will this run? So if somebody adds an event or removes one does it synch fairly quickly?